We are blessed February 4, 2019 with a beneficial New Moon in Aquarius sign of dawning, ready to begin with fresh inspirations. This lunation marks too the threshold of a New Year in Chinese astrology so we prepare as well to welcome the Year of the Golden Earth Pig. This is a wonderful vibration for all kinds of creative endeavors, beneficial partnerships, & new projects. Aquarius is an eclectic energy, bright & curious with a deep connection to intuition & creativity. It vibrates with individuality, uniqueness, eccentricity, & inventiveness. 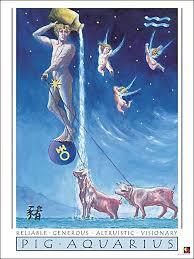 This air sign draws in the new & unusual, promotes change & innovation while relishing in radical discovery. Now is the time to take a leap into something new, to dare to be yourself, & try a new way of believing as you make your dreams come true. In Chinese astrology the primary traits of the Earth Pig are compassion, optimism, & dedication. We can expect a year of harmony, wealth, & good fortune to come through nurturing ourselves, being dedicated to our vision, & staying community minded in our decisions. This vibration will help us help each other & bring healing relief while supporting us in building wealth, creating health, sustaining relationships, & embodying joy. We can find ourselves inspired & enthusiastic about achieving goals & “getting to the next level” with projects, hobbies, & practices. It’s important to pay special attention to how we are using our energy so as not to push too hard or too fast. Easy, methodical, ritualized will be the models for success. Stay focused but take breaks, be dedicated while balancing enough work/play/rest into our days & all will be well & prosperous under the light of the New Moon in Aquarius.